For this blogger’s choice recipe swap, I decided I wanted no part in choosing the recipe. I wrote down some things that I thought Tom would like and handed it to him, telling him it was completely his choice. Jaida has pretty similar tastes to Tom and I so knew I whatever he chose would be tasty. I expected him to choose something like the Buffalo Chicken Pizza Puffs or Firecracker Shrimp or Pulled Pork Tacos since they are all right up his alley in tastes and ingredients. 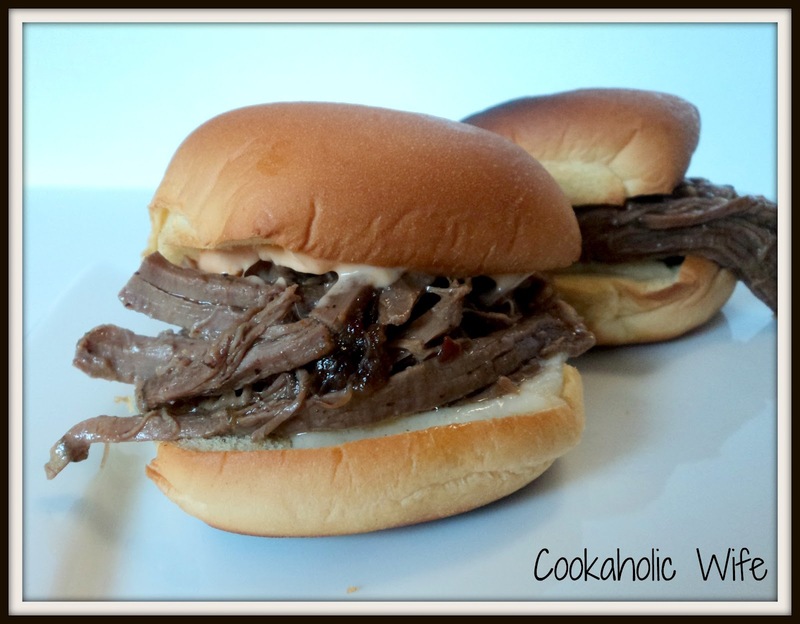 But he surprised me and chose the Slow Cooker Pot Roast Sliders. Then I decided I couldn’t leave this 100% up to Tom. I also decided to make Jaida’s Tomato and Cucumber Salad. A fresh summer salad was just calling to me. Come back on Tuesday to see that recipe! Whisk together the water, Italian Dressing mix, Onion Soup mix, and Au Jus Gravy mix in a bowl. Stir in the salsa verde. Place the roast in a slow cooker. Pour the mixture over the roast. Cook the roast on low for 8-10 hours or on high for 4-6 hours. Remove the beef from the slow cooker and shred it. Return to the slow cooker until ready to use, allowing the meat to reabsorb the juices. Toast the tolls and assemble each slider with a piece of Swiss cheese, a dollop of Sriracha mayo and a heaping pile of the shredded roast. Yum! After shredding the beef I made the decision to return it to the crock pot to let it absorb the juices it cooked in. I think this made a huge difference in the flavors. I had to switch up the envelope flavors just to accommodate what I could find in the stores. I opted for a Sriracha mayo instead of the horseradish sauce since Tom isn’t a horseradish fan. Even with slight changes, this is still an incredibly filling and tasty recipe. We’ve enjoyed this for lunches every day this week. I have to say, this is definitely the first time ALL of the leftovers are being used! These sound delicious! And I love crock pot recipes, especially now that fall is coming. This would be a great meal to throw in the crock pot while watching football all day. I'm so glad you liked these, and how fun that you let Tom choose!! I love the pairing of pot roast and sriracha! I know my husband would love these sandwiches!